This vivid and unforgettable expedition through the world of exotic fruit, from an author with “the talents of a food writer, investigative journalist, poet, travel writer, and humorist” (The New York Times Book Review), is being made into a documentary starring Bill Pullman. 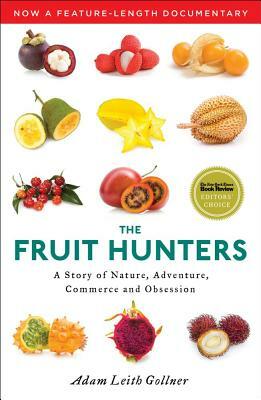 A vivid and unforgettable expedition through the world of exotic fruit, The Fruit Hunters is the engrossing story of some of Earth’s most desired foods told by an intrepid journalist and keen observer of nature—both human and botanical. Delicious, lethal, hallucinogenic and medicinal, fruits have led nations to war, fueled dictatorships and lured people into new worlds. Adam Gollner examines the fruits we eat and explains why we eat them (the scientific, economic and aesthetic reasons); traces the life of mass-produced fruits (how they are created, grown and marketed) and explores the underworld of fruits that are inaccessible, ignored and even forbidden in the Western world. Peopled with a cast of characters as varied and bizarre as the fruit it discusses—smugglers, inventors, explorers and epicures—this extraordinary book can “fill a thousand and one summer nights with delightful reading” (The Miami Herald ).